The dialogue was held as part of a working visit by a high-ranking delegation from Vietnam’s Ministry of Defence to the UK from November 27- December 1 at the invitation of the UK Ministry of Defence. During the event, the two sides spoke highly of recent important results in the bilateral defence cooperation. Regarding bilateral collaboration in UN peacekeeping operation, Deputy Minister Vinh thanked the UK side for its coordination with and support for Vietnam in preparing and despatching the level-2 field hospital No. 1 in South Sudan. 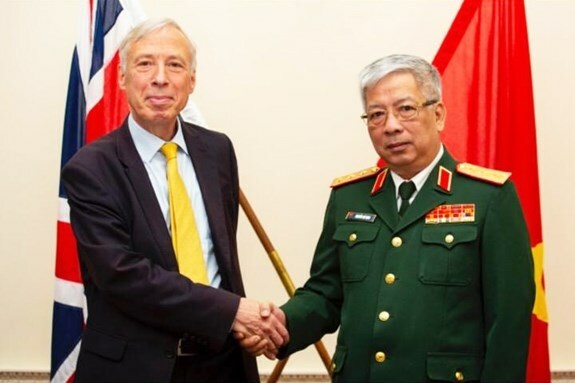 For his part, Earl Howe praised the professionalism and efficiency of Vietnam’s military medical personnel who are serving at the UN peacekeeping mission in South Sudan. The UK side is willing to coordinate with Vietnam in arranging military medical and engineering units to joining UN peacekeeping activities in the time to come, he affirmed. The two sides agreed to continue with their effective cooperation in the fields of training, defence industry, and exchange of views on strategic issues. On the occasion, they signed an agreement on geo-space cooperation. They also compared notes on regional and international issues of common concern. During his stay, Deputy Minister Vinh meet with Chief of the UK Defence Staff Gen. Nicholas Patrick Carter, and Minister of State for the Foreign and Commonwealth Office Mark Field. He also had working sessions with representatives from the International Institute for Strategic Studies (IISS), the Royal United services Institute (RUSI) and some UK defence enterprises.